Baking is an all-year through activity. It is more interesting to bake different kinds of cakes in different shapes. Your baking cup determines how interesting baking becomes to you. If you interested in baking cups, which are an accordion-sided paper or foil cup in which muffins and cupcakes are baked, please help yourself here. Muffin tins are lined by the baking while you make muffins or fairy cakes or cupcakes as they are commonly known everywhere. The baking cup replaces the need to grease the cup in which the cake is baked. They are made of pleated wax-treated paper or pleated foil. Reusable ones are made from silicone. Baking cups come in various sizes to fit tins of different sizes. Paper baking cups are better to use in case you plan reheating muffins in your microwave. Baking cups are an ideal choice when a large order of muffins is made. Baking cups are also used to make caramel apples and certified Kosher ones are available. Our bakery supply dry waxed fluted baking cups reduce cleaning up and waste and make baking easy and quick. 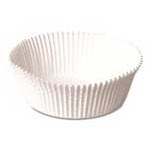 Dixie Fluted Baking Cup Circles are dry waxed paper that holds shape and helps to hold in baked product moisture and freshness while helping the paper to release when removed. Sanitary package helps keep cups clean while holding the cup shape so they fit in the pans without popping up. They also eliminate the need for greasing pans and reduces cleaning up of pans. One can find definitely fewer damaged baked products with no need to use spray-on releasing agents. You could save money by lessening pan washing too. Baking cups make handling easy and clean, without touching the product with hands. The baking cup acts as a protective sanitary cover around the baked product. Moreover baking cup holds the necessary amount of moisture to extend shelf life. Enjoy baking using baking cups certified Kosher.